I graduated couple months ago, and as I walked across the stage I told myself, “I’m never going to do design again.” I had told many of my professors that I was only finishing up because I had been in school for so long, and I was exhausted with it. What I really wanted to do was go to school for journalism. Now that I’ve been out of school for a handful of months, I’ve realized that I do enjoy design, and I miss having assignments. As soon as I graduated, I went out and got myself an iMac. My lovely Lydia sits at my desk, waiting for me to use her. I also bought a MacBook Air, which I use constantly; it’s portable, but can’t handle the stresses of being used for design, that’s usually saved for Lydia. But I do use design software, and I love it. Like I had in school, I have a subscription to Adobe’s Creative Cloud. The system is incredibly easy to use, and unlike the Adobe Suite I had in classes, the Cloud offers tutorials and helpful hints for design in each of it’s programs. Though I only use InDesign, Adobe Illustrator, Photoshop, and Bridge, the Cloud includes so much more, that I may attempt to learn about in the future. When I claimed to be done with design, I was incredibly wrong. I do enjoy design; I love photography, live for nice text layouts, and I like playing in Illustrator and Photoshop. 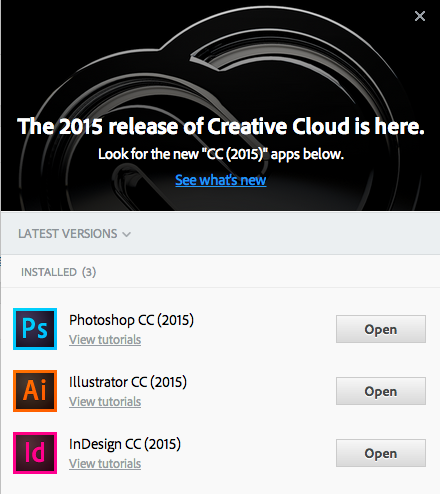 If you’re a student in the field, get the Creative Cloud. With recent updates, you can work from your mobile devices as well as your computers (I haven’t tried this yet because my iPad is so old, and my phone is so full, but it looks amazing). It’s easy to use, with tutorials in the programs and easily accessed online, and it’s fun. And if you’ve just graduated and think you’re done; don’t let your degree go to waste. Hone your skills and keep working, you will learn new things, and probably enjoy yourself.